This extremely versatile camera cage is designed for the Sony a7 series of cameras as well as the Sony a9. It provides a high quality aluminum, CNC-milled protective armor for your camera that has several ¼”-20 and ⅜”-16 mounting points for attaching accessories. A detachable top handle is included and features a cold-shoe mounting point (an additional cold shoe mount is on the top of the cage itself). This handle easily slides on and off of a small NATO rail that’s attached to the top of the cage. On the bottom of the cage is a quick release plate that is attached to a 15mm LWS baseplate. This baseplate allows you to attach various accessories via 15mm rods and can mount to a Tilta Standard Lightweight Dovetail Plate to allow you to easily slide on and off of an operating setup. The baseplate also has a lens adapter support bracket built in to allow a way to mount various lens adapters (support screws for Metabones EF and PL mount adapters are included). An optional right-side wooden handle can be added to your order. This handle is beautifully hand-carved from Bubinga wood and features an ergonomic design. It includes a recording run/stop button built in as well as a R/S cable of your choice. The wooden handle is attached via an Arri Standard Rosette connection on the right side of the camera. 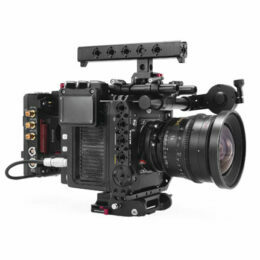 This updated Tilta Cage (ES-T17/A) is available now at tilta.com and authorized dealers.